Barking, howling, whining, growling—it's all dog talk. Barking is a natural means of communication for a dog. A bark can be a warning, a greeting, or an invitation to play. Your dog's tendency to bark a little or a lot is partly inherited. Some breeds bark a lot; others bark very little. Your dog may also have learned that barking gets him what he wants—he barks and you let him in, let him out, feed him, talk to him, play with him. Barking becomes a behavioral problem when it goes on too long or too frequently. Dogs become problem barkers for many reasons. 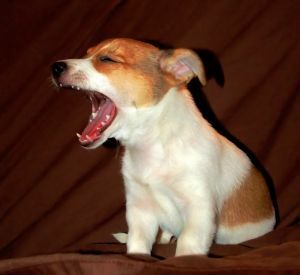 The first step in controlling excessive barking is to find the reason your dog barks so much. A dog that spends too much time alone may become a problem barker, particularly if he doesn't get enough exercise. Sights and sounds in your dog's environment may trigger barking—not usually a problem unless it's too frequent or lasts too long. 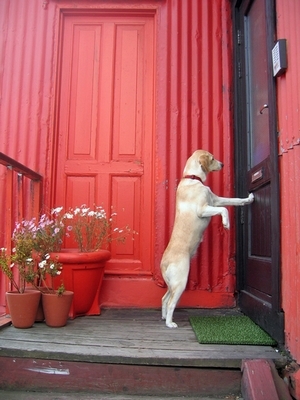 Dogs with separation anxiety are often problem barkers. Aggressive dogs and highly territorial dogs may bark at anyone or anything that comes near. Barking is hard to stop because it's self-rewarding. You can usually reduce nuisance barking, though, with time and effort. If your dog seems to be barking out of boredom or to get your attention, you may be able to slow him down by giving him what he wants—on your terms, of course. Make sure he gets enough exercise every day. Take him through an obedience class. Even if he doesn't bark in class and you don't directly address the problem there, training often helps problems of all sorts. Besides, if he's lonely and bored, he'll love spending time with you in class and practicing outside of class. Don't leave your dog outdoors when you're not home. Let your neighbors know that you're trying to solve the problem. Most people will give you a little leeway if they know you're trying. Teach your dog that having people around is good for him. Have a friend walk by your yard. Have a tasty treat ready. If he stays quiet, praise him and reward him. If he barks, tell him “Down,” and when he's quiet, praise and reward. Have your friend come a bit closer and repeat the process. It may take several sessions (and several friends so that he learns that the rule applies to everyone), but eventually he should be much more tolerant of people walking near your yard. If he barks indoors, have him lie down and be quiet, and praise and reward him. Be consistent—don't encourage him to bark one time and discourage him the next. Various types of “bark collars” are available. They work by administering a “punishment” in the form of an electrical shock, a spray of citronella (which dogs don't like) aimed at the dog's nose, or a high-pitched sound. Although bark collars may seem like an easy solution to problem barking, they don't address the cause of the barking. If your dog barks because he's bored, he may simply replace the noise with a different behavior like digging or destructiveness. If he barks to defend his territory, he may associate the shock or other punishment from the collar with the person he sees as a threat, and he may become aggressive. If he barks because he's afraid or anxious, a collar that punishes him will frighten him more. Digging is an instinct for all dogs. Some breeds—terrier breeds and Dachshunds in particular—were bred to dig vermin and game out of holes in the ground, so they're even more eager to dig than the average dog. One way to stop a determined digger from tearing up your whole yard is to give him his own digging range. Pick a spot for him, preferably a shady spot with loose sand or sandy soil (it's cleaner than clay or loam). If necessary, consider making him a sandbox for digging. Bury a treat or toy that your dog likes, then bring him to the spot, and when he notices the scent of the treat, encourage him to dig. You dig a little with your hands if necessary to give him the idea. Praise him when he digs, and when he reaches the treat or toy. Repeat a few times over the next few days. If you see your dog digging somewhere else, tell him “Leave it,” take him to his spot, and encourage him to dig there. He'll get the idea after a few days. 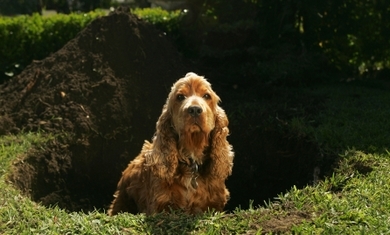 Aside from being there and stopping him, there are ways to discourage your dog from digging. Some of these methods work with some dogs but not all. If your dog tends to dig in one spot, maybe near a gate, you may be able to discourage him by filling in his hole with rocks or concrete. I stopped my dog from digging up one section of a flower garden by burying chicken wire about three inches deep. It didn't interfere with the plant roots, and my dog didn't like hitting that wire with his feet. Some people use chemicals and other substances to discourage digging. Black pepper sprinkled on the area stops some dogs. Some people bury mothballs, but they are toxic and they don't make your yard smell too great. Several commercial products are available that are supposed to stop digging, but they don't always work, and they don't provide your dog with an alternative. If he was digging out of boredom, he'll find something else to do, and it may not be any more agreeable to you than the digging was. Retraining and redirecting energy is the best solution. A dog with separation anxiety becomes worried and agitated whenever she thinks her owner is going to leave. Once she's alone, she may bark or howl, salivate or even vomit, urinate and sometimes defecate, pace the floor, or become destructive. To treat separation anxiety, you first need to make sure your dog and your belongings are safe when you're not there. Crate-train your dog, and crate her when you leave. Many dogs feel safe in their crates, and an anxious dog often feels more secure when she doesn't have to worry about where to be in the house. If you crate her with a bone or chew toy, she'll have something to do but won't cause any damage. Teach your dog the Stay command. Have her stay for varying lengths of time while you're home with her, working up to half an hour or longer. Praise and reward her for staying and becoming relaxed. Have her spend some time in her crate while you're home, too, so that it's a safe place whether you're there or not. Don't make a fuss over your dog when you leave or come home. That just teaches her that your absence really is something to fret about. When you're preparing to leave, put her in her crate a few minutes ahead of time to give her a chance to relax. Give her something wonderful that she gets only when you're about to leave—a hollow bone or rubber chew toy stuffed with peanut butter and kibble, for instance. Once she's crated, ignore her. When you come home, don't let her out right away—let her settle down and get used to your being home. Make your coming and going very matter of fact. Figure out what makes your dog most relaxed and comfortable. If she likes to look out the window, place her crate where she can see out. If that seems to make her more anxious, then put her crate where she can't look out. Sometimes leaving a radio on to soft music and talk helps a dog relax. Some dogs seem happier if they have a little something of their owner—maybe an old sweatshirt with your smell on it. I had a dog that always took one of my walking shoes to his bed when I was gone. He didn't chew it; he just had it with him. If you have to be gone long hours, consider having someone come in during the day to give your dog a break. Just having to “hold it” for 9 or 10 hours could make some dogs anxious—I know it would me! If your dog doesn't think your leaving means he'll be all by himself for so long, he may not be quite so worried. If you can't solve your dog's separation anxiety problem, speak to your veterinarian or a qualified animal behaviorist. They can help you evaluate your dog's situation and set up a treatment plan. If absolutely necessary, you can try an anti-anxiety medication to break the cycle, but drugs are not a long-term solution.